Despite recent advances in developing evidence-based psychological interventions, substantial changes are needed in the current system of intervention delivery to impact mental health on a global scale (Kazdin & Blase, 2011). Prevention offers one avenue for reaching large populations because prevention interventions often are amenable to scaling-up strategies, such as task-shifting to lay providers, which further facilitate community stakeholder partnerships. 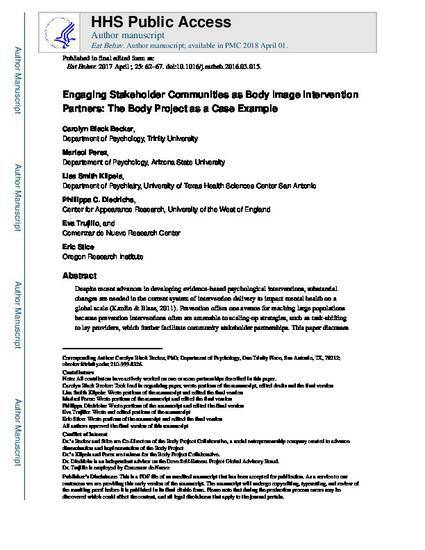 This paper discusses the dissemination and implementation of the Body Project, an evidence-based body image prevention program, across 6 diverse stakeholder partnerships that span academic, non-profit and business sectors at national and international levels. The paper details key elements of the Body Project that facilitated partnership development, dissemination and implementation, including use of community-based participatory research methods and a blended train-the-trainer and task-shifting approach. We observed consistent themes across partnerships, including: sharing decision making with community partners, engaging of community leaders as gatekeepers, emphasizing strengths of community partners, working within the community's structure, optimizing non-traditional and/or private financial resources, placing value on cost-effectiveness and sustainability, marketing the program, and supporting flexibility and creativity in developing strategies for evolution within the community and in research. Ideally, lessons learned with the Body Project can be generalized to implementation of other body image and eating disorder prevention programs.